The Antique Advertising Expert provides free appraisals on your antique advertising collectibles. 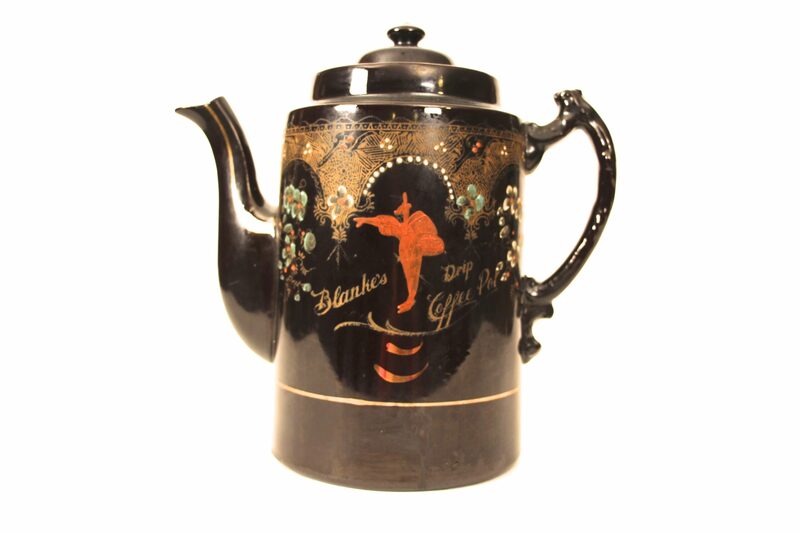 This C. F. Blanke coffee pot is ceramic and was produced in 1904. C.F. 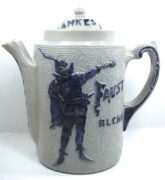 Blanke Coffee and Spice Co.manufactured the Faust Brand and it was originally a local brand based in Saint Louis, MO. Eventually, the brand was developed in many markets throughout the mid-United States. While some of the Faust Brand coffee pots are commonly found this particular one is considered very rare. It was most likely introduced at the 1904 World’s Fair in St. Louis. because the brand sponsored an Asian garden at this worldwide event. Featured is a beautiful reverse on glass shoe sign from the Burt and Packard Company formerly in Brockton, Massachusetts. 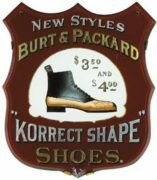 This sign advertises their Korrect Shape Brand of shoes. Circa 1905. Featured is a beautiful tin coffee can from the Biklen Winzer Grocery Company in Burlington, IA. The can features a horse or thoroughbred image with the name Derby Coffee. Whether this is a correlation to the Kentucky Derby or not, I simply do not know. But it would make sense! Pictured is an early coffee tin can from the Durand and Kasper Coffee Company, which was based in Chicago, Illinois. This particular can is a round canister with a removable lid. It dates to the 1905 era. 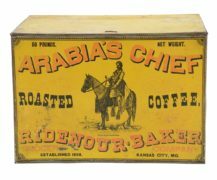 Pictured is an early General Store Wooden Coffee Bin from the E. C. Scudder and Brother Coffee Company, based in Saint Louis, MO. Later this company became the Scudder-Gale Grocer Company in the 1920’s. An awesome stenciled wooden display piece. Circa 1900. 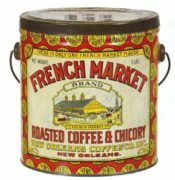 French Market Roasted Coffee Chicory Can, New Orleans Coffee Company, New Orleans, LA Louisiana. Three pound store can. Featured is a beautiful tin three pound coffee can from the A.J. Kasper Company for their Turkey Brand of roasted coffee. 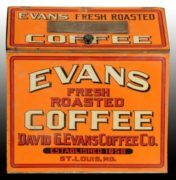 Featured is an early metal general store coffee bin from the David G. Evans Coffee Company out of St. Louis, MO. This company was later famous for their Old Judge Coffee Brand. A colorful coffee can from the Stone Ordean Wells Coffee Company which was based in Duluth, MN for their Metropolitan Brand of Mocha and Java Coffee. 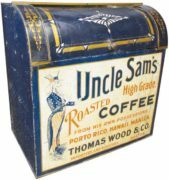 Featured is an early wooden general store coffee bin from the Canby, Ach, and Canby Coffee Manufacturer based in Dayton, OH. This bin advertises their King Bee brand of coffee. A STUNNING TOSETTI BREWERY STEIN – CHICAGO, ILLINOIS! STAR BRAND SHOES WERE BETTER BASED ON SALES ALONE! BEACH-NUT TOBACCO WAS A HOUSEHOLD NAME! MARCH 17, 2019! ANTIQUE BOTTLE SHOW IN ST. LOUIS. LOTS OF OTHER ADVERTISING TOO! HONEST SCRAP TOBACCO’S FAMOUS DOG & CAT FIGHT LOGO! SACRAMENTO’S BUFFALO BREWING BOHEMIAN GIRL SHINES TODAY! A STUNNING BARTLETT SPRING MINERAL WATER SERVING TRAY!